Eco-Shippers and Eco-Natural Shippers (made of 100% recyclable material) have been used for years by large cost-conscious shippers around the world and now you can take advantage of the environmentally-friendly shipping option. One case minimum on stock and custom printed shippers make them ideal whether you are an online store or a store front retailer. Dura-Bags provide an ideal solution for companies interested in reducing shipping, mailing handling and storage costs. They consist of two sheets 35# Kraft paper reinforced with fiberglass, these attractive mailers ensure strength and security in protecting your products during shipping and storage. They Resist tearing and Puncturing, keep dirt and moisture our and are lightweight to reduce postage costs. Jiffy® Mailing Envelopes is the brand name for bubble mailing envelopes. 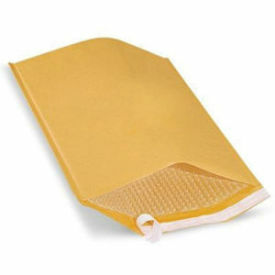 The clean, tough, air bubble lining of Jiffy Mailing envelopes is covered with a strong, goldenrod Kraft Paper.